This guide covers your options should you choose to convert from SLS1 to SLS2. Keep in mind that none of your old sites has been converted yet - neither your homepage nor any of the interior pages. You may start the conversion process when you are ready to proceed. NOTE: Once you proceed to convert, the conversion must complete before you can do anything else. Most sites take under 15 minutes. If you have a big site with a lot of documents in the locker, it could take up to three hours. 1. 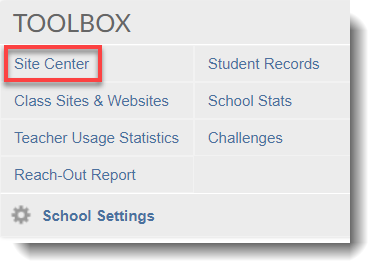 Login to your School Loop account, click Site Center under the Toolbox Menu. 2. Site Center will bring you to a page with the option to convert to SLS2. NOTE: Having a big site with multiple documents may take some time for the conversion to finish. You can shut the tab and come back later. Once the conversion is done, your Site Center will show that you have a homepage on the sitemap. The preview on the right will display placeholder content in the SLS2 homepage template for your site. It’s perfectly safe to create new sections pages before converting your old site. After conversion, your site will have all your old and new content. Note that your old site will be converted as it exists and it’s not possible to predetermine where the converted pages will be placed. Visit our Help Center for more information about adding new sections and pages. While you may choose to start working on your homepage - adding text, images, and so on - you should only do so if you do not want any of your old homepage content brought over. If you’d like to work on your homepage, go to Step 3 of the Easy Start Guide: Convert to SLS2 using Snap Templates.